The seventh week of protests at the Preston New Road fracking site near Blackpool began with further arrests of activists opposing shale gas exploration. Police say the number of arrests made at the site is around 30, generally for suspicion of offences under Section 14 of the Public Order Act. The arrests on Monday 6 March came as some protesters appeared at Manchester’s High Court following a fresh application from exploration company Cuadrilla for an injunction outlawing public access to its Lancashire site. Judge Philip Raynor QC granted the injunction but refused the application to limit protesters to a 25m by 25m area, which he called “unreasonable” and a potential source of “increased anger”. But a Lancashire councillor has said tensions are already permeating the site and expressed concern about increasingly violent tactics by police managing fracking protests after she was injured at the gates of the drilling site last week. 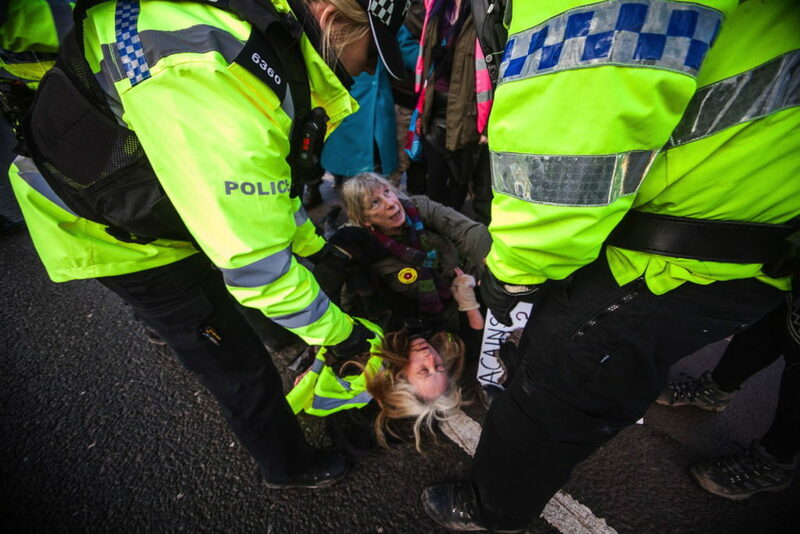 Miranda Cox, who represents the Kirkham North ward on Kirkham Town Council, described being forcibly shoved to the ground during police kettling of a group of anti-fracking protesters on Wednesday 1 March. Cox was taken to Blackpool Victoria Hospital by ambulance with torn ligaments to her knee, along with fellow protester Maria Allen, who was treated for concussion and bruising to her back. It follows a series of incidents in which protesters have been hurt during conflict with police, including a reported incident on Tuesday 28 Feb in which Fylde Borough councillor Roger Lloyd, 68, received back injuries. Cox was one of around 10 protesters who linked arms in front of the entrance to the fracking site to obstruct a lorry gaining access. “Police are now denying us any opportunity to slow walk the lorries so we decided to stand across the entrance and make a stand,” she told Big Issue North. Video footage of the incident shows Cox, wearing a red hat, fall before being pulled out of the crowd. Allen can be seen on the ground, apparently unconscious, along with another protester – Joe Haslam – who is removed by police. Photos taken at the time show Haslam being walked away in handcuffs. On Friday 3 March protesters claimed a police barrister visited Preston New Road and Cox has been invited, along with other injured protesters, to a meeting with the police chief inspector on Wednesday 8 March. Police made at least three more arrests during protests on Tuesday 7 March. The anti-fracking protest at Preston New Road has been active since contractors AE Yates began preparing the site for shale gas extraction in January. Video footage emerged early on of on-site security behaving aggressively towards protesters. One from 7 February shows a truck reversing into two people. Cox, who has been at the site daily, says Cuadrilla security has since eased off but that the police are becoming increasingly hostile. “After the first week or so when the security were quite brutal there were a few changes of staff and they backed off but the moment you go near the fence they’re on you – they won’t touch you but they’re at your face,” said Cox. Last week Lancashire Constabulary apologised after wrongly accusing a large number of anti-fracking protesters of taking direct action during a planned solidarity event at the Preston New Road site on Saturday 25 February. The police reported 150 people tried to break through fencing to get onto the Cuadrilla site but later said it was just a handful of protesters. Campaigners said access was gained through a gap in a hedge. The application for an injunction from Cuadrilla quickly followed the breach. Anti-fracking protests in Lancashire have so far been dominated by local residents, including a group of so-called nanas who call for safe and peaceful protest. But campaigners from around the North West and further afield have joined the demonstrations and set up a “protection camp” nearby, on Dugdales Close. The camp was served with an eviction notice last month but has not yet been moved on. Campaign group Reclaim the Power, which demonstrates against fracking across the country, has announced a series of direct action pop-up protests in Lancashire on 27 March-10 April, targeting companies supplying services and materials to the Cuadrilla site, aiming to pressure them into dropping contracts. The tactic has already been used ad hoc by protesters, leading to six companies, as of 2 March, ceasing contracts. Cox said she was keen to avoid any division between local and national activists. She and other residents are now running a regular Friday night meeting for the protection camp at a community centre in Warton, where the campers can have hot showers and a warm meal. Using police force...it's ridiculous how many police for one small group of peaceful protesters. Coming in with a heavy hand never works to create peace, it just agitates. Thank you for a balanced and well written article. I'm a local who has been at PNR since Cuadrilla started work in January. It's good to see a true picture of what I see unfolding every day. The sad fact is that the police presence and their prevention of peaceful protest by violence is escalating. This is obviously part of the government's agenda to push frackng through at all costs whether it's to the environment or the communities caught up in this dreadful prospect. The heartening thing is that people refuse to be deterred by police intimidation or the lies put out by the local, pro-fracking press and those short sighted businesses who expect to profit from fracking. Congratulations on your new website ! Strong images, interesting and in-depth articles as well as being very pleasant to navigate through. I am a local family man and have been on pnr most mornings early. All ok with police liaison, trouble start when the bully boys in riot vans turn up en mass! They are plain ignorant, just thugs with a badge! Don't accept our right to protest and protect our families and our Community from the dangers involved in the Fracking process! Excellent factual report, thank you Antonia and Big Issue.